Belladonna* loves you and needs you…. Previous post: PEN American » Weekly Poetry Roundup! Advanced ticket sales are only $12! At the door, tickets are $20. The Belladonna* Benefit will showcase a performance by Anne Waldman and Ambrose Bye, live auction by renowned auctioneer Erin Ward of Star Benefit Auctions with special assistant Amy King, and a dance performance by the A.O. Movement Collective. 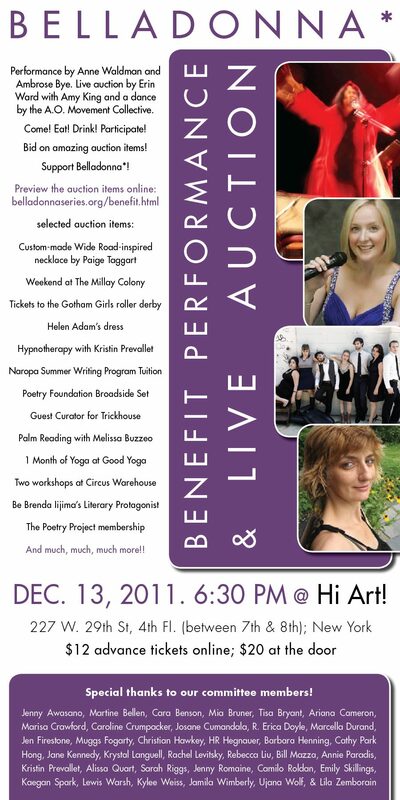 The Auction and the Benefit will support Belladonna*s 2012 season of publications and events, which share a theme of caring for the material realities of poets, viewing a publishing project holistically. We’re referring to 2012 as The Year of Material Lives, and we plan to host combination readings/dinners with ample time set aside to discuss the economic and social concerns of writers, artists, publishers, and other creators. Moreover, in addition to continuing our commemorative chaplet series, we hope to publish five full-length books of hybrid and experimental work in the coming year including new work by Julie Patton, LaTasha N. Nevada Diggs, and Tonya Foster. At the auction, we are hoping to earn the funds to complete our budget for 2012. This year we’ve been fortunate to be the recipient of funds from both NYSCA and The O Books Fund, but we still have work to do to make our goals a reality! Part of our benefit proceeds will also support honoraria for our wonderful interns. Please come out to support Belladonna*! Are you able to contribute a little extra to our benefit? Thank you! We really appreciate it! Friend: For $25, you’ll receive admission to the benefit and acknowledgement on our website. Super Supporter: For $50, you’ll receive admission to the benefit and acknowledgement on our website, a complimentary Belladonna* book of your choice, and our undying love and gratitude! Belladonna* Lover: For $200, you’ll receive two Benefit tickets, a full limited-edition Elders Series set, 5 signed chapbooks, and a one of kind Belladonna* bag. Are you going to be out of town, but still want to support us? We’d love it if you could purchase a ticket on behalf of a local New York poet! Please include a note when you purchase your ticket. Thank you!